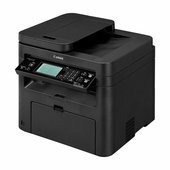 With print speeds up to 28 ppm and automatic duplexing features, the imageCLASS MF247dw All-in-One Monochrome Laser Printer from Canon is a powerful and fast unit designed to increase your productivity with printing, scanning, copying, and faxing. The print resolution of 600 x 600 dpi with the monochrome laser provides a high quality equivalent to about 1200 x 1200 dpi. 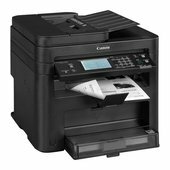 Print speeds are also quite fast in duplex mode at up to 16 ppm. Scanning and copying is possible at resolutions up to 600 x 600 dpi and a color depth of 24-bit through the use of the flatbed glass or a 35-sheet automatic document feeder. Copying can also benefit from the ADF's duplexing capabilities. Paper handling is done through the ADF, a 250-sheet input tray, or a 1-sheet manual bypass for specialty media. Additionally, this variety allows for documents up to 8.5 x 14". The MF247dw is durable with a monthly duty cycle of 15,000 pages and versatile with USB 2.0, Ethernet, and Wi-Fi connectivity options.